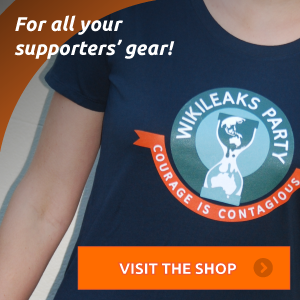 The WikiLeaks Party is a new force on the political block – from nothing to over 1000 members and many more supporters in a few short months. Our members and supporters come from across the political spectrum because the values we uphold are the bedrock of democracy. This Party is built on core WikiLeaks values – transparency, accountability, the free flow of information and protection for individuals when it comes to the exercise of power by the state. The campaign we are running is deliberately targeted at the Senate. Why? Because the Senate is the check and balance on the Executive – or that is the theory anyway. The Senate is the house where MPs ought to scrutinize government policy and hold it up to the light. Mary KostakidisToo often though… the Senate is a deal making house where there are trade-offs so the government of the day can get its way. WikiLeaks Party Senators would actually do their job differently. When it comes to policy all information ought to be on the table. There should be no hiding behind national security and commercial in confidence… so that policy discussions are hamstrung by lack of important materials. We the people have a right to know what our elected representatives do and say in our name and we have a right to participate in a meaningful way in policy discussions that ultimately impact us all. The Party’s Senate campaign is currently taking shape in three states – Victoria where Julian Assange is proposing to run, New South Wales and Western Australia. We intend to stand at least two candidates in each state. On the all-important issue of preferences the Party has not yet made a decision but certainly those political forces and individuals whose values align best with the WikiLeaks Party will naturally be higher up the list of those we preference. This campaign is obviously a little different because we have a candidate in London. Greg Barns our Campaign Director will be working with Julian Assange this weekend in London on Julian’s schedule for the upcoming federal campaign. Let me deal with some of the critiques of the WikiLeaks Party campaign that are currently floating around the media and among other political parties. Firstly – this is certainly not Julian Assange’s ‘get out of jail’ card. If that were the case Julian could have simply run as an Independent. Thirdly – the idea that the WikiLeaks Party is a one-issue party. If by this people mean the overriding commitment to transparency and accountability in all we do… then yes in some respects you could say we are a one issue party. But in terms of policies and positions on issues, I can assure you that this is not the case. Over June and July the Party will be releasing a number of position statements on a range of issues as diverse as whistle-blowers protection to youth employment. We have of course already announced our position on Shield laws and a commitment to introducing legislation, which will properly protect journalists and their sources. This federal election is one in which it seems the House of Representatives vote is locked in – a Coalition victory seems likely. But the Senate is far from decided and there is in the community a hunger for fresh alternatives to the existing players and business as usual. Ultimately it is up to the people of Australia to decide whether we will continue to have our democracy overtly and covertly influenced by the rich and the powerful voices that appear to have ear of successive Government’s. Or… if we will choose a bold new direction and open up our political system to begin the journey of reclaiming our democracy for the people. Will we choose to return the Senate to house of oversight and review and elect those that cannot be swayed, even by some of the most powerful voices on this planet. I hope we choose a future in which the powerful are held to account and the people’s voice and liberties are respected. We stand at a crossroad that will determine the future for all of us here tonight and for generations to come, and to me this is what makes the 2013 federal election an exciting not only for the WikiLeaks Party but for the people of Australia. Regardless of what you do on Sept 14th, we have an obligation as Australian citizens and compatriots of Julian Assange to support, protect and defend him, because what they do him… they could ultimately do to all of you and to me. overall flexibility. I make visible the ever flowing effervescent light which can not be destroyed, subdued or silenced. around you in the exhibition. Thanks to Julian and all supporters. Yes we need to unite and act as one. This is more than about democracy or free speech. It is about our Freedom and our future existence. If we miss this opportunity to act now than tomorrow it will be too late! executing UN and USA corporate policies in the effort to enslave us.. They do not represent Australian people for a long time now therefore should be called illegal. They use the money we pay in taxes against us ! Chem trails is one of the examples. We Australian people have a DUTY to withdraw our support to this illegal and criminal government and give maximum support to new forming parties which strive for human freedom and dignity. Love to all who work hard to make a difference. Thank you. I’m undecided between this party and another, Can you tell me wikilieaks party’s stance on Speed cameras? The Greens are the antipathy of an open democratic political party. Its conferences are closed to the media and public. Its policy making decision process is far from democratic, we only have to look at how the Greens act and behave in Local government where decisions are made behind closed doors. I am also interested in electoral reform and updating the method of counting the Senate vote to ensure it truly reflects the voters intentions. A weighted transfer value. Single transaction per candidate – no segmentation, a reiterative count, reset and restart count on every exclusion. Abolition of the Droop quota, Pure STV proportional representation and a reiterative count. I totally reject the Tasmanian-ACT Hare-Clarke last bundle system. All aboard the revolutionary train. For all the reasons we all know, Julian is the last best hope for true democracy. But to my way of thinking, Julian is the antithesis of the very dangerous Gina Rinehart – whose evil has not yet come to fruition. My thoughts on her and the mining money requires a blog post which I will post to twitter. She is to be stopped at all costs. The Wikileaks Party is the only resistance that can fight her. “Hello, can you please advise if the WikiLeaks Party is now a registered political party”? Hello, can you please advise if the WikiLeaks Party is now a registered political party?? I would love to see the Wikileaks party include measures to counter the growing power of the state and its representatives to misuse powers and responsibilities, in order to malign and harrass individuals. I think the term is ‘police state’ and I’d like to see a side by side comparison of a definition and examples of it manifesting in present-day Australia. Also, a call for a Bill of Rights. And inclusion of Aboriginal and Torres Strait Islanders in our Constitution. Absolutely disgraceful neither of these exist in 2013. Then I can almost look forward to September! Why do you not join with the Pirate Party ? Many voters are weary of the dominance of the two-party system in Australia and the team sport that politics has become (ie. win at all costs) rather than an opportunity to make good policy. Social democracies that serve the interests of inluential groups with access to government without scrutiny fail their charter. The never ending approval of mining leases (like CSG) to the detriment of the environment and communities is only one example. 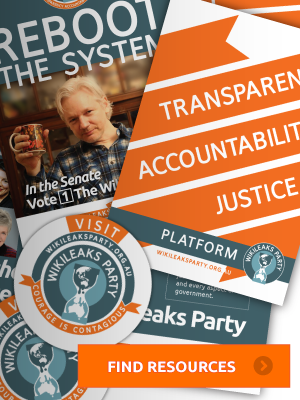 The Wikileaks Party will provide a much needed emphasis on transparency and accountability which has eroded into a system of insiders who have privileged access to information that should be in the public domain. I hope there is also some policy about democratic participation and the involvement of citizens in some policy areas via referenda on matters where there is clearly a public interest but no action from governments. Sapere aude! Honesty, Accountability, Transparency, and Responsibility; All should be key drivers in our everyday lives to help ensure governance by the people is focused for the people and communities it represents. It is the courage of individuals to follow ‘Sapere Aude’ that will break the shackles of despotism, and reveal through public discourse, for the benefit both of the population and the state, better methods of governance, transparency of policy and accountability for compliance in responsible representation. This is my hope for the Wikileaks Party. I wish you al the best, and the rest of the world is hoping you make it, well at least the ones that like things like democracy….real democracy! also not to be nit picky but your page is about to get seen by a lot of people, can you add the word ‘to’ in front of ‘him’ on the last sentence. Just keeps it all nice and tight. As a Wikileaks party member it is hard to wait til September and find out how successful our party will be. You are right whatever wrong has been done to Julian can happened to any Australian citizen and it is time we have a transparent and down to earth leader ship to make this country what it should be. I hope all sincere Australian will support our party on pooling day. All I can say it’s about time someone stood up and said enough of the lies. Good on you Julian and the Wikileaks Party and I’m looking forward to September! I support Wikileaks party. We need strong media with the power to promote alternative ideas and viewpoints. I think that the free exchange of ideas encourages us to expand our understanding and promotes tolerance. By sharing information we can prevent the corrupting influence of the over concentration of power. I am opposed to the American industrial military complex influence over the Australian government. I joined Wikileaks to demonstrate my support of free speech. I joined in the hope it would help Wikileaks to get the required number members to register as a political party. Julian has made a difference and I hope the party will continue to make a difference. And when it comes to making a difference, no greater difference can be made, than returning the people’s Section 41 Rights to them. The High Court of Australia altered the Commonwealth Constitution in 1983 by interpreting the peoples right to vote out of their Constitution. And there was no Julian Assange or a Wikileaks party back then to trumpet the fact that the people’s Constitution should only be altered via referendum. Section 41 is still in the Constitution, but the Commonwealth says it is null and void. Section 41 gives the people a constitutional Right to Vote. And if the Commonwealth acknowledged that right, Electors could fill out their ballot papers as they saw fit, and prevent their vote from being distributed to the corporate puppets in both major political parties, if the Elector so wished. Now that would make a difference! And that’s precisely why our most important Right has been stolen from us. 50% of MP’s are lawyers. But it’s the lawyers on the High Court who have done the Australian people the greater damage. You cannot play footy without knowing the rules. You cannot be effective on the political battlefield without knowing your Constitution. It is the rule book for politics which is why you are taught next to nothing about it at school. You’ve seen the massive rock doors in the Indiana Jones movies where you press in just the right spot, and the mountain moves. A little pressure in regard to Section 41, and you just might move a mountain. It would certainly scare the pants off the corporate world and the MP stooges who are their political puppets. As a preamble, hopefully this start launches a consciousness that will to strip away deceit and return simplicity to the decision making processes that are made in “our” best interest . There can be no illusion; it is going to be hard work. However, if the survey results are accurate Wiki Leaks is starting from a sound base to launch and entrench a modicum of integrity back into the political sphere. We are not there yet. I too have a healthy cynicism of the concept of Commercial in Confidence in any dealings where the common wealth of this country is exploited by vested interest and wish for it to be removed from the lexicon of public/private and political discourse forever. I look forward to the policy direction in the coming months and hearing and seeing our candidates arguing our position. However, Assange is important to the Putsch to undermine vested interest, globalisation and corporatisation of government. He alone cannot hope to sway the masses. As a new member I hope we can prevail where the Democrats and Greens have failed as we brace ourselves for the heady days we face. I hope that Wiki Leaks can maintain its independence and utilitarian position to treat every piece of legislation on its merit and do not become another Harradine or Lees or the NSW state government. Good policy is good policy and does not need to be bartered. Our Communities Environment and Well Being deserves better and it starts here. I look forward to your campaign and will help where I can. Make no mistake: the outcome of the Wikileaks Party’s successes will significantly affect the great malaise of the politically disenchanted youth throughout the world, not only in Australia. Our coming success here will at a minimum bring renewed effort to Europe, where the Pirate Party has already made progress, and possibly even to the United States. It may also provide a touchstone or reference cache of standard reforms for new or threatened regimes following popular uprisings. As the world moves away from nationalism (Einstein’s “infantile disease, the measles of mankind”), in no small part due to the positive capacities of information technology to educate and inform, our individual and local actions possess the ability to influence humanity’s broader condition far more deeply and powerfully than ever before. There is a long way to go, but each of our steps will be felt and remembered. Join us on the path to a better future – one free of corruption and tyranny. This party is also my last hope! corruption in parliament? we are always the last to know if ever. As a paid up member I have 3 questions. Schapelle Corby? West Papua? and the $458 (plus) million per year in “foreign aid” to Indonesia???? these are just my top three questions! The Democrats used to boast that they were there “To keep the Bastards honest”, but ultimately forgot their own slogan. Unless Australians stand up for what Julian Assange has tried to do, ie, shine a light on what is REALLY happening, we are in big trouble. We have gone to war, (Vietnam, Iraq, Afghanistan) based on the lies fed to us by a useless media, paper, and electronic, to serve America, which is now a fascist regime. Come on Australia, we’ve been in labour for too long. lets pass this big brown stinky government! We pledge solidarity to Julian Assange on behalf of the good he has already done and the good he and this party can do in the future. Wikileaks! Very eagerly looking forward to having people in the Senate doing what the Senate is for. I believe each person elected to Government has an obligation to their own electorate firstly, and not to rubber-stamp what the “People in Power” in a party tell them to do. By having genuine overseers we will again have a system working as it was intended. I have joined the Party and am very optimistic about our future now. This Party is my last hope. Hayek wrote of “Democracy, the God that failed”. Lobby grouppen from the military-industrial complex own the political process now, ourselves too complacent to care. SOMA Anyone?